From the Disney Teacher of the Year and New York Times bestselling author comes the classic guide to bringing out the best in your students, revised and updated for today's teachers and parents. When Ron Clark walked into his fifth-grade class in rural North Carolina, he was confronted with disinterested children in desperate need of structure and compassion. Brainstorming how best to reignite their love of learning, Ron created 55 lessons. Soon his fifth graders were reading at a sixth-grade level, engaging in class, and loving school. What's more, they were gaining something crucial: self-respect. These lessons evolved into The Essential 55 - guidelines for students on how to live and interact with others. Ron lit a fire under parents and teachers around the world to raise their standards and expect the most from their students. The Essential 55 features a new foreword from Ron and a fresh take on his classic rules, with eight new and updated guidelines. 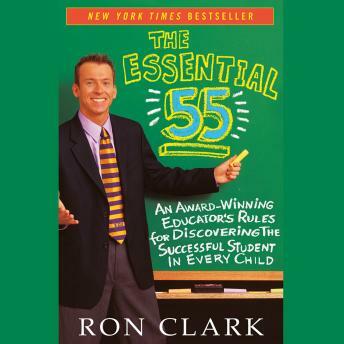 Ron's 55 ideas show that with determination, discipline, and regular rewards, the children you stick by will be the children you come to admire.